Have you ever wondered what would happen if “the tumbler” from the Chris Nolan Batman films made sweet, sweet love to the Delta-wing race car? Well it seems that “Batman vs Superman” director Zack Synder has wondered the same thing and has chosen to give life to that theoretical love child for his upcoming superhero flick. Today he tweeted a teaser shot of the new Batmobile and despite it being mostly covered up by a tarp, it has a clear “delta” shape but with large tires in the back which harken to the “tumbler” which came before it. According to his tweet we may get the full reveal tomorrow. 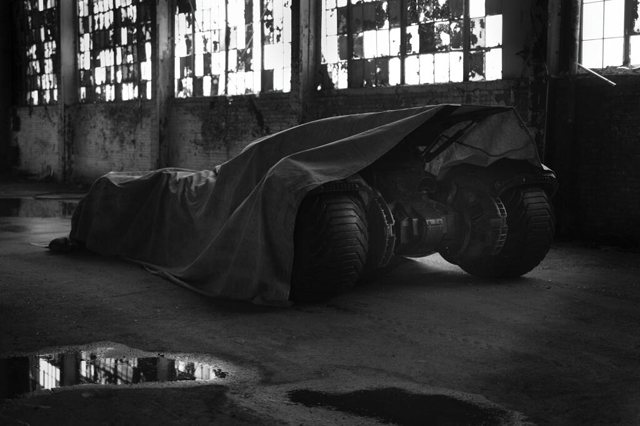 What do you think of the new Batmobile? Do you like the direction that Synder has taken or do you prefer the tumbler? You can click the thumbnail below for a larger picture.